The super-slim, 0.19" (4.85mm) Oppo R5 was announced at the end of October and was quickly proclaimed the thinnest smartphone in the world - an impressively elegant handset, obviously meant to please users who place aesthetics as a top factor when picking a smartphone. To round off the package, Oppo equipped the R5 with a 64-bit Snapdragon 615, 2 GB of RAM, and a generous 13 MP / 5 MP camera sensor combo. So how does this combo of elegance and top-of-the-midrange hardware work? Let's check it out! Due to the size constraints, Oppo was unable to pack a 3.5mm headphone jack on the device and hasn't equipped it with a dedicated speaker for audio – its earpiece doubles as a loudspeaker. The lack of these components actually contributes to the device's uniform look, as there are no excessive grilles or openings to disrupt its solid lines. Fear not, the _phone_ comes with its own proprietary headset, which connects via micro USB. 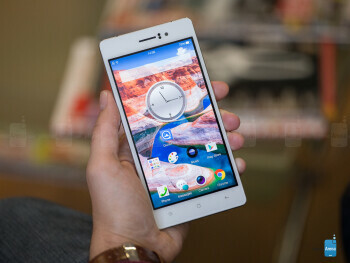 The Oppo R5 comes loaded with Android 4.4.4, heavily skinned to become what the company calls "ColorOS" – a simplified interface that does away with the app drawer, adds customizable gesture controls, themes, and a few other small, but useful functions. Users of the Find 7, Find 7a, N1, or N3 who have used ColorOS v2.0.1i will instantly feel at home, while others will have to traverse only a minor learning curve. On the R5, the software does not stutter or exhibit huge hangups, but there is an ever-present and very minor delay when scrolling through home screens – it doesn't feel as if the hardware is having a hard time drawing, though, so we wonder whether Oppo went a bit over the top with trying to make the animations feel buttery smooth, and accidentally overdone them to feel sluggish. That being said, users will enjoy scrolling around, though, those coming from snappier interfaces will need a little time to adapt and not feel constantly annoyed. The gesture controls include the well-familiar double-tap to wake, but barely end there. When the screen is off, the user has a choice to draw a circle, which will open the camera app, or draw a V-shape, which starts up the flashlight. Swiping downwards with two fingers will play / pause music playback, and drawing a > or < shapes will skip to the next or previous song, respectively. Once the display is on, the user can control volume, by swiping up or down with two fingers. Swiping with three fingers will snap a screenshot. If these are not enough, one can call up a gesture board by pulling up from the bottom of the screen. Here, the user can draw the "O" or "V" gestures for camera / flashlight, or enter the Settings and create their own gesture commands for a select group of predetermined functions or apps. In our experience, gesture app-launching was generally slower and more unreliable than just scrolling to the needed app and tapping its icon, but we did enjoy using the touch-controlled music playback, volume set, and screenshot features. 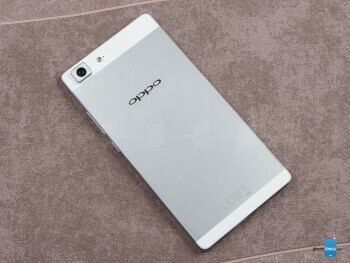 Not only is the Oppo R5 one of the thinnest smartphones in the world, it's also one of the first to come with an octa-core, 64-bit, Qualcomm-made SoC on board, ready to enter the Android Lollipop era with full force (and we are assuming that Oppo will update its newest devices to the new OS, sooner or later). Qualcomm introduced the Snapdragon 615 in February, 2014, and this is our second taste of the new SoC (the first one being HTC's Desire 820). The 600 series is usually where the upper mid-range class of Qualcomm-made processors resides, and for what it is – we are more than pleased with the SD 615's performance. Web browsing is a breeze and 3D games run smoothly, even on the highest setting. The SoC is paired with 2 gigabytes of RAM, which is now the norm for a phone that takes itself seriously, and we had a hard time making the device exhibit a hiccup. 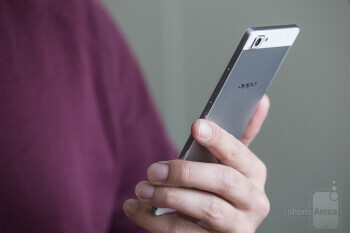 The R5 does tend to get hot, though, this is expectable with its slim body. 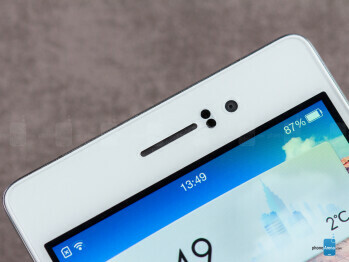 Oppo has said that it's used materials that dissipate heat faster and “radically improve thermal efficiency”. Still, we'd keep a watchful eye on any signs of overheating and avoid over-stressing the device (using it while charging, for instance). Unfortunately, the phone's size shows to be a hindrance yet again, as Oppo only fitted it with 16 GB of internal storage, 4.5 of which are taken by the OS, and there is no slot for an external memory card. As previously mentioned, the screen wields a very dense pixel-per-inch ratio, which makes even the finest of details crisp and clear. This is, of course, great for web browsing, and is aided by a smooth performance with minor stutters, which appear on heavy web pages. There is no proprietary browser – Oppo offers Google's Chrome out of the box, knowing that this would be enough for most users. The R5 is LTE-capable, for your fast data-downloading needs, has Bluetooth 4.0,aGPS , and 802.11 b/g/n/a Wi-Fi; somewhat regrettably – no NFC. The main camera module houses a 13 MP Sony IMX214 sensor, with an F2.0 aperture size, while the frontal cam has a selfie-afficianado-pleasing 5 MP resolution. The camera app is among the better ones we've seen, offering a rich choice of modes (and a selection of downloadable ones), among which one can find Auto, HDR, UHD, Manual Mode (called Expert Mode), Colorful Night shot, and others. Switching over to the frontal cam automatically activates the Beauty Face function and gives the user a variety of filters to choose from. In well-lit situations, the camera snaps quickly and gives us generally balanced pictures – colors are represented accurately and the images are neither oversharpened, nor extremely soft. Indoor, the sensor does a great job at capturing a good amount of light and detail, even in darker situations. The phone's HDR function is a letdown – sure, it does light up all the dark corners in an image, but the whole picture ends up looking like it has its contrast set to low and brightness to high, while also being covered in grain. It is still usable in some dark situations, but is mostly hit-or-miss. 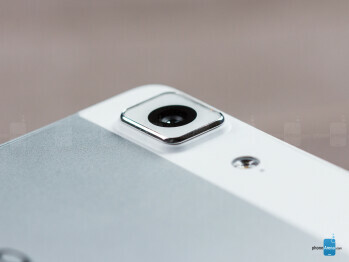 The Expert Mode offers access to manual focus, exposure compensation, shutter speed, ISO, and white balance settings. While its options are not extremely elaborate, users who enjoy tinkering to get the best photos possible will be pleased with it. Video recording is not much different – we are treated to a balanced picture, though, not-so-impressive audio. The crisp 5.2” FHD screen contributes to a satisfying viewing of pictures and video – as long as vivid and oversaturated colors are your thing, the R5 will not disappoint. Audio, on the other hand, is a different bowl of rice. Since Oppo decided to use the phone's earpiece as a makeshift loudspeaker, the quality is not the best – a lack of volume and depth is combined with a hump in the mid-frequencies, creating a sort of an annoying, old-school, busted radio effect. It is not unbearable, but would not be our first choice for listening to music. 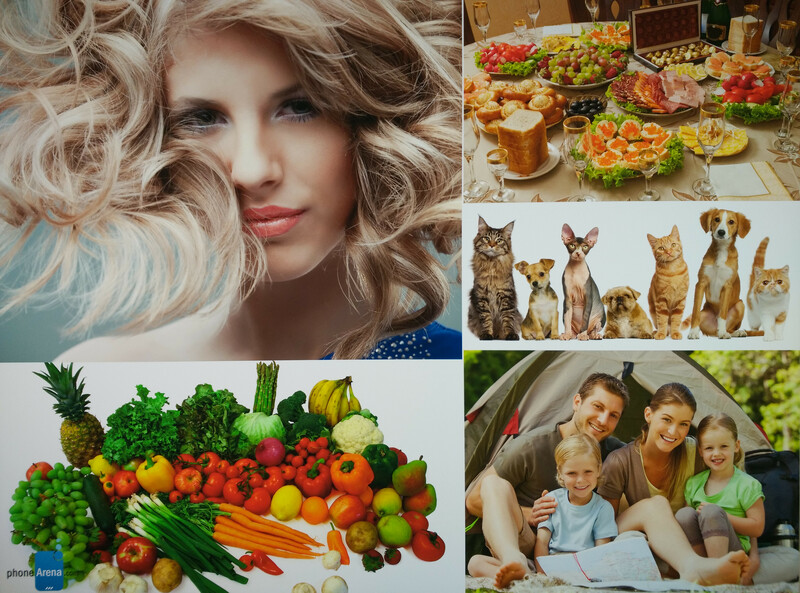 In-call, we had a bit of a hard time understanding what the other side is saying – the volume was lower than desired, the voices sounded digitized, and the lack of depth and mid-range hump was, again, present in the sound. The audio was not unbearable, though, if one tends to spend a lot of time in phone calls, they would most likely not be pleased with this handset. The other side had a better time than us, as the R5's microphone tends to send a loud audio signal; even though it is still muffled and inarticulate – it's more easily understandable than what's coming in from the earpiece. Having a thin phone is great and all, but a lot of users would agree that the compromise in battery size makes for a bad trade-off. In this case, we are on the fence, as the R5's 2,000 mAh juicer managed to last 5 hours and 8 minutes in our battery life test – quite an impressive feat, since the juicebox has to power a 5.2”, 1080p display, but still – lacking way behind other premium Android handsets. There is also Oppo's VOOC tech – a technology, which uses a 4.5 A charger, and a circuitry inside the smartphone, which protects the battery from damage. So, the Oppo R5 charges up from 0% to 75% in about 30 minutes, while going to the full 100% will take around 73 minutes, as the last 10% of battery take quite a while to fill up. Super-fast charging is great, though, it doesn't really make up for a mediocre battery life – we doubt purchasing the thinnest smartphone in the world, only to have to lug around its bulky charger, is what users have in mind. Our real-life experience with the device shows that, with casual use, it can last one through the day. It manages to hold its charge very well in standby mode, and if it's used for the sporadic phonecall / e-mail check / chat / picture share, it will not leave its owner high and dry. 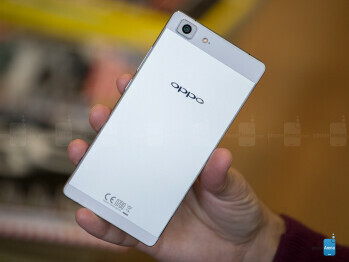 Additionally, Oppo has included two tiers of power saving to help users out when in a tight spot and low on power. A very elegant handset with a sizable display to boot – the R5 seems to be for casual users, who prefer their smartphone to be a modestly used tech accessory, rather than a tool for long surfing and gaming sessions. Physically, the device provides a very pleasing experience when used, while the user interface could do with just a few minor tweaks – snappier menu scrolling being at the top of the list. A good camera, paired with an adequate and comfortable to use shooting app, and a well-performing SoC under the hood round off the package. If a super-thin phone is what you are looking for, then the R5 is a good option, but be wary of the tradeoffs – sub-par audio quality, a battery that doesn't agree with heavy usage, low internal storage with no option to expand. If you wish to check out other svelte choices – take a look at the Gionee Elife S5.5 (rebranded as BLU Vivo IV in the US), though, we believe that the R5 is a few steps ahead. If you are willing to go up a notch in thickness, you could take a look at the new Samsung Galaxy A5, which also promises a premium design in a 0.26” profile, a 13 / 5 MP camera combo, and the new Samsung Themes customization options. We also can't help but think of the R5 as a competitor to the iPhone 6, aiming to beat Apple at its own game of “going thinner”. Well, if that's the case, Oppo may have just hit the nail on the head – the device is indeed thinner than the iPhone and has an equally poor battery life, but for its going price – we can't say that it's a better choice than the iOS-bearing flagship.